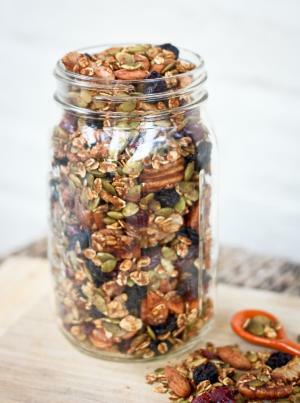 A hearty, homemade granola offers the nutritious benefits of nuts, seeds, and dried fruit, while satisfying a sweet tooth the natural way. It’s a great option for pre-workout fuel, breakfast, or as a snack atop a cup of yogurt, or with a splash of your favorite ice-cold milk. Integrative Nutrition graduate Brittany Mullins puts a seasonal spin on this crunchy alternative to plain cereal. Mix sucanat, cinnamon, paprika and pumpkin pie spice in small bowl. Set aside. Place almonds, oats, pecans, pepitas and walnuts in large bowl. Mix together pumpkin puree and apple juice; pour over nuts and toss until evenly coated. Sprinkle nuts with spice mixture, tossing to coat well. Spread the mixture evenly on two baking pans. Bake 30-35 minutes, stirring halfway through cook time. Stir in cranberries and raisins. *Use certified gluten-free oats for a gluten-free version. The ingredients in this recipe can easily be adjusted according to your dietary preferences and personal taste. A Junk Food Fight: Should the Government Get Involved?